How and where to download the latest WordPress plugin. This article is part of a series on getting started using TubePress as a WordPress plugin. Visit the Downloads page in the TubePress Dashboard. 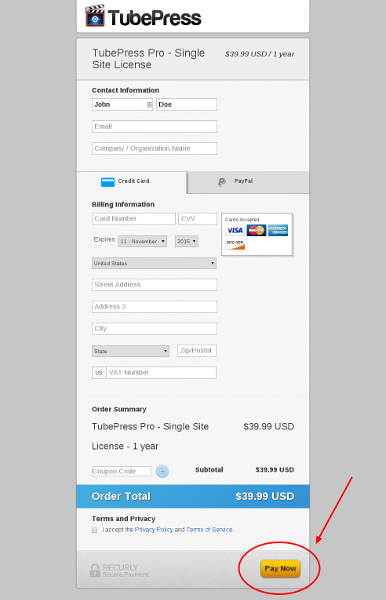 If you've already paid for TubePress Pro, please skip to step 5. On the Downloads page, you'll see a list of available downloads with TubePress Pro at the top. You may download the free trial version of TubePress here, or you may click the "Buy Now" button when you are ready to buy. You'll be presented with a secure payment page where you may choose to pay with credit card or PayPal. Enter your billing information and click "Pay Now". After payment is complete, you'll be redirected to a Thank You page. Now revisit the Downloads page where you will have access to TubePress Pro. Click the "Download" button to download TubePress Pro as a zip file.